Walt Disney's World Incredibles Summer has taken over the monorail system. Important information about changes to Monorail routes over the next few weeks. The monorail serving the Magic Kingdom will be operating on reduced hours this weekend. See the latest movie-monorail tie-in - the Zootopia Monorail System. Very disappointing...slow, frequently stopped due to congestion on the track, outdated interior appearance. We ended up walking to and from the Contemporary to MK because the monorail was so slow. The only reason I am adding a comment to this is because I saw a rating of 9.4. If Disney has a 10 anywhere on the grounds it is the Monorail. Far and away the best service you will get at WDW. The Walt Disney World monorail system is the best invention disney has cooked up since the 1st park opened in 1955. Walt Disney has been & always will be one of the top inventors of all time. Walt Disney - R.I.P. The Walt Disney World monorail system is the best invention disney has cooked up since the 1st park opened in 1955. Waly Disney has been & always will be one of the top inventors of all time. Walt Disney - R.I.P. The Walt Disney World Monorail System opened on October 1 1971 with Mark IV monorails servicing the Transporation and Ticket Center, the Magic Kingdom, and the Magic Kingdom Resorts. The system was expanded with the opening of the Epcot line servicing the TTC and Epcot on June 1 1982. Later, from 1986 to 1988, the system was upgraded to Mark VI monorails. New features included improved air conditioning, door systems and safety features, a re-designed interior, additional standing room for peak travel periods, improved sliding-door systems, on-board monitoring and improved communications and control. Specifications: Each of the six-car trains is 203 feet long and has 124 rubber tires powered by 600-Volt DC propulsion systems, including eight DC motors rated 113 HP each. Train bodies are made of a high-strength composite honeycomb material that allows high strength at a low weight. Trains travel on a 26-inch-wide concrete beam supported by tapered concrete columns approximately 110 feet apart. The beams and columns are constructed in sets of six and post-tensioned together to form a single 600-foot structure. As trains move along the beamway, they pick up electrical power from a metallic buss bar. Nearly 7,000 guests per direction, per hour. On a typical day, more than 150,000 guests use monorail transportation. Walt Disney World Resort has a 14.7-mile system of elevated beamway that services seven stations throughout two theme parks and several hotels. Each of the current 12 monorails are identified by a colored stripe. The current colors are: Peach, Teal, Red, Coral, Orange, Gold, Yellow, Lime, Green, Blue, Silver, Black. Photos of the monorails. Pink and Purple were retired following the accident in 2009. Monorail Teal: Teal was built by combining the undamaged portions of Pink and Purple. It took it's first test run on the Express Beam on the evening of 3 November 2009, and it entered service with guests at 1:30pm on 4 November 2009. Photos of Monorail Teal. Monorail Peach: Monorail Peach is comprised of cars 1 to 5 from Monorail Purple, and car 6 from Monorail Pink. The cabs on the front and back of the monorail are completely new and built from scratch. Peach debuted on the Express Line on October 11 2011. Monorail TRON (aka the TRONOrail): As marketing for the 2010 movie TRON Legacy, Monorail Coral was covered in a full piece of TRON artwork. The nose cones of the monorail were painted blue, while the rest of the artwork was a wrap. It debuted on March 19 2010 on the Epcot beam. Photos of Monorail TRON. Monorail The Avengers: A promotional wrap for The Avengers movie was installed on Monorail Red and debuted on the Express Beam on March 31 2012. Photos of The Avengers Monorail. 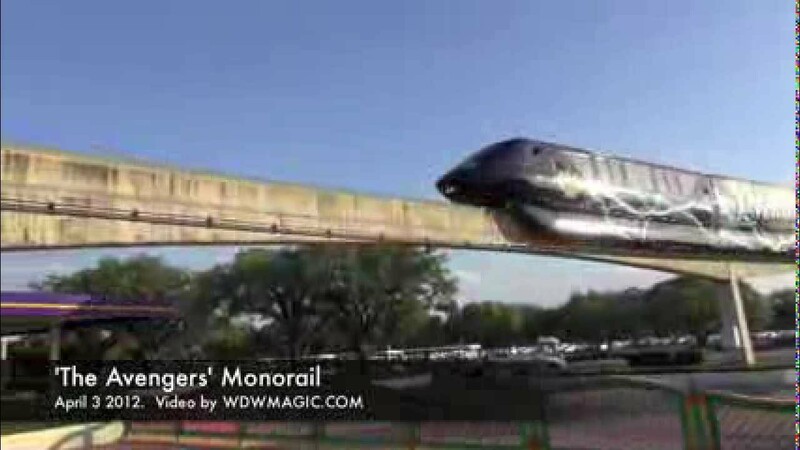 Video of the The Avengers Monorail. Iron Man 3 Monorail: A promotional wrap for the Iron Man 3 movie was placed on Monorail Black and debuted on the Express Beam in March 2013. Photos of the Iron Man 3 Monorail. Monsters University Monorail: Characters from the Monsters University movie appeared on Monorail Teal from April 24 2013, traveling on the Express Beam. Photos of the Monsters University Monorail. 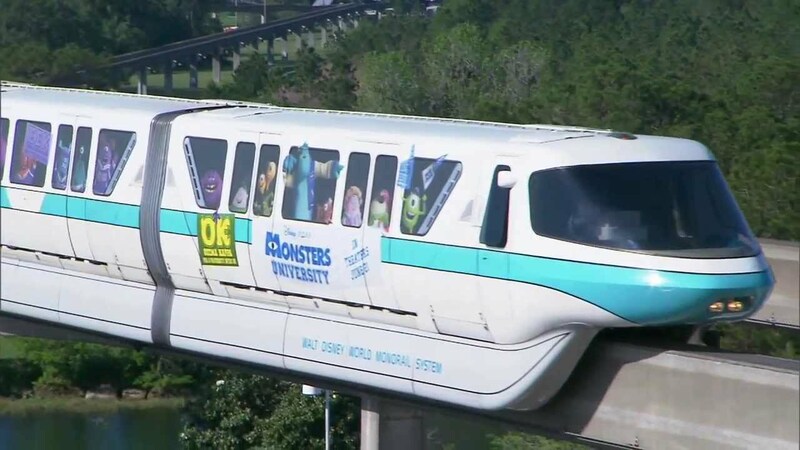 Video of the Monsters University Monorail. Stations: Transporation and Ticket Center, Epcot, Magic Kingdom, Contemporary Resort, Polynesian Resort, Grand Floridan Resort. The Epcot Monorail runs from 8am until 2 hours after regular hours park closing. The Express Monorail schedule begins 30 minutes prior to Magic Kingdom opening until 1 hour after regular hours park closing. The Resort Monorail runs from 7am until 1 hour after regular hours park closing at the Magic Kingdom. For ticketed events, such as Halloween and Christmas Party nights, the resort monorail runs until 30 minutes after the event ends. Transportation and Ticket Center to Polynesian Resort to Grand Floridian Resort to Magic Kingdom to Contemporary to Transportation and Ticket Center.